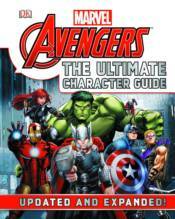 This revised edition of this superb guide to the characters of Earth's mightiest Super Hero team, Marvel Avengers: The Ultimate Character Guide features a further 20 new heroes and villains. As ever, each character is illustrated with original art by Marvel Comics' finest artists, and the text has been updated to include new events in the Avengers' world, such as the dawn of the Heroic Age and the emergence of a new team, the Uncanny Avengers, which includes X-Men Rogue, Havok, and Sunfire. This edition contains 24 new pages of content.